Our laboratory offers a complete range of comprehensive medical testing, from complete blood counts and Vitamin D levels to cholesterol checks and routine blood work. 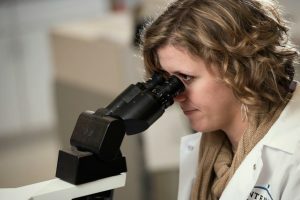 Our experienced laboratory technicians and technologists are nationally accredited by the American Society for Clinical Pathology, and our lab is both College of American Pathologists and Clinical Laboratory Improvements Act inspected. We offer the convenience of laboratory services at our Portland, South Portland and Yarmouth locations. Quest Diagnostics is a partner of InterMed and supports testing when needed. Appointments for laboratory studies are made through your physician’s office. Here are some of the most common laboratory tests that your provider may order, based on your medical history. This information is not a recommendation of what tests should be done for screening purposes. A type of fat which circulates in the blood. High cholesterol levels are associated with increased risk of heart disease. Exercise and diet can lower cholesterol. Occasionally, medication is required to lower your cholesterol. Your cholesterol goal is dependent on your risk factors for heart disease. A type of cholesterol believed to be responsible for depositing cholesterol in the blood vessels of the body. Generally, it is desirable to have this below 130. If you have diabetes or heart disease, you should have it below 100 or 70, respectively. A type of cholesterol which helps to remove bad cholesterol from the circulation. An HDL of greater than 60 may help reduce the risk of heart disease. Another type of fat in the blood stream that may contribute to heart disease. High triglycerides can be associated with increased risk for diabetes and can be reduced with a low carbohydrate diet and fish oil supplementation. A test that looks at the types of cells in your bloodstream. It is used to diagnose anemia, infection, certain cancers, and other conditions. The most relevant components for general testing are WBC (infection-fighting white blood cells), HGB (oxygen-carrying hemoglobin), HCT (oxygen-carrying hematocrit) and PLT (blood-clotting platelet cells). Generally, if these four tests are normal, then the overall test is considered normal, even if some of the other components are marked abnormal. Monday – Friday, 7:15 a.m. – 5 p.m.
Monday – Friday, 7:00 a.m. – 5 p.m.